We're getting set to plant. I'm hoping the bottom field has dried out enough by Saturday to plant. There's about an acre down there that's been pretty wet for trees for about a year. 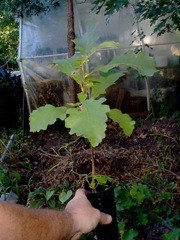 I ordered a selection of species to try some more wet tolerant trees down there. I plan to plant right down the same rows we planted before so we retain alleys that can be mowed. I am buying a mower to use during the season and hope CRP will allow us to keep those weeds down. I was thinking about band spraying princep again this year (at the right rate this time). Am I correct to think we should spray the furrow over the newly transplanted trees? Would you rather we apply a general spray over some or all of the remaining land? Would there cost-sharing available for some or all of this land? Roland will pick up the trees Friday. We are planning on starting to plant on Saturday -- probably not until noon because we have a bowling banquet Friday night -- unless we skip that. 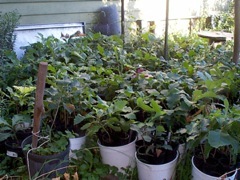 We'll plant as much as we can with the planter and fill plant the rest as fast as we can (maybe the next weekend). No problem with CRP and keeping the weeds down. Yes, spray the furrow of the new trees. You can broadcast spray if you want also. 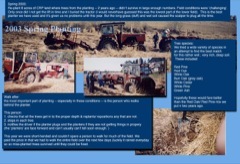 You can request cost sharing on the CRP replant. I don't think so on the release spray elsewhere. Call FSA ASAP to see what you have to do to request cost-sharing. I'll have the planter at the farm, probably Friday. I'll try to stop in on Saturday probably 11 or so and see if your there. We should spray Simazine on both the bottom and the strips. 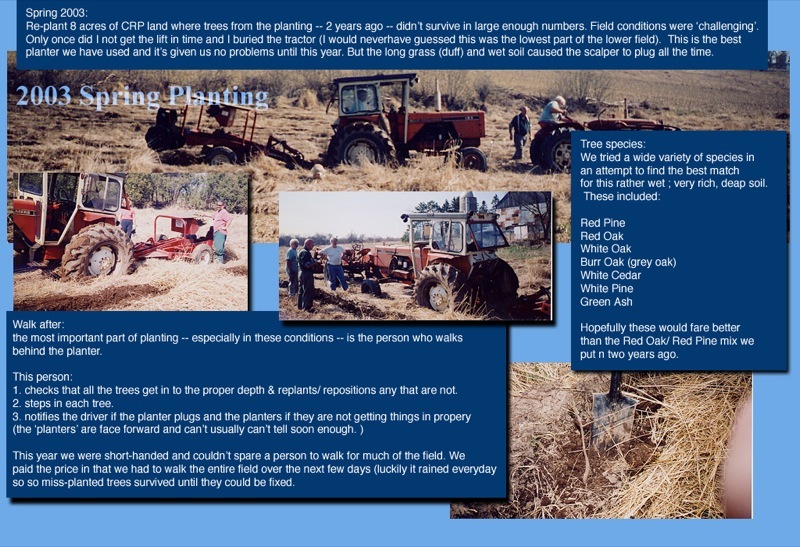 This is a collage of pictures from the 2003 planting. So far it's all I can find for pictures. Click on this picture to display a version that is large enough for you to read. We have used Simazine on ash with no problems. You can up the rate, your soil is fairly heavy so it shouldn't hurt anything. Do not use Oust. The rate is so low (1/2 oz per acre) that it is tough to regulate and Baron County killed 300,000 red pine one year. If you want to mix something with Simazine, try Pendulum again. Used with Simazine, we have had decent luck. Again at 3-4 lbs per acre. It's expensive though. 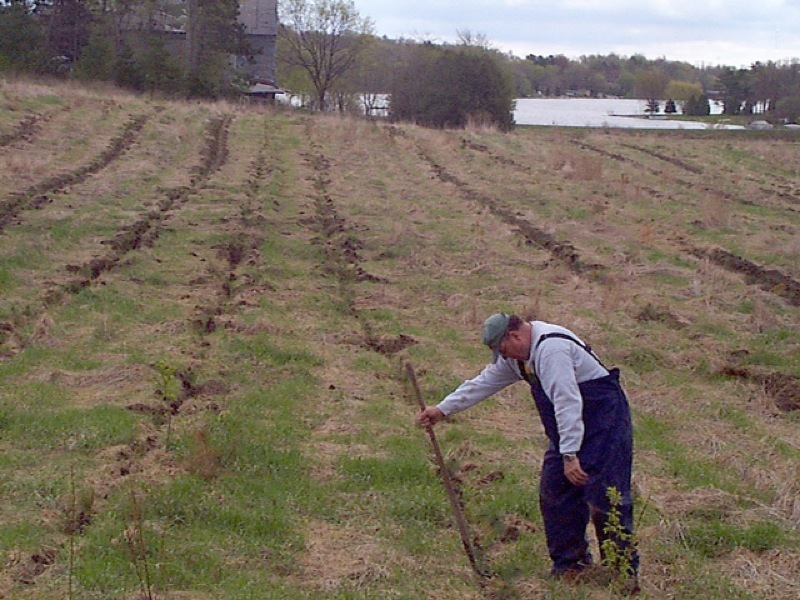 [ from field notes ] Win and I walked the newly planted rows all the way across the 40 - from the road to the woods. We each took a row or two and walked with shovel . stomping plants were the dirt hadn't been properly closed around roots. [this mounted planter did a very poor job at closing the trench after the tree was planted ] We found spruce that had been planted too deep and hardwoods that hadn't been planted deep enough . but most of all it was good . Much better than I thought. Hardwoods were out 2 - 3 inches. Where root was exposed we dig a little trench 'down stream' (in the direction of travel -- away from the trailing root. The tree could be pressed down into that trench and covered in such a way to cover the exposed root and then stood straight up again. Many of the trees that had this problem had a diameter of 1/2 inch or bigger (these ere supposed to be 2 year oak -- I don't think so) and the roots were huge. Amazing we could get them in with a planter at all. Win and I covered 6 rows in our trip up and back. There are 26 rows all together in the bottom. 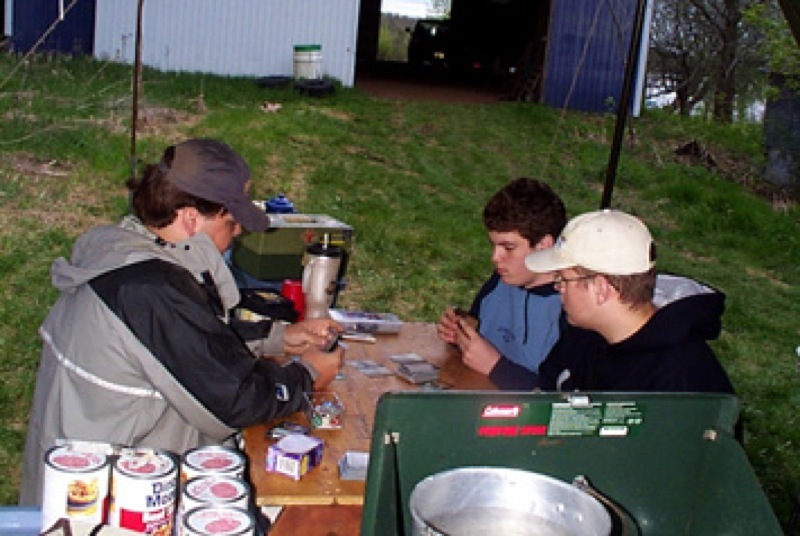 May 10, 2003: - Host Boy Scout troupe at farm to help 'fix' tree planting. Scout troupe setting up tents at farm. We invited my son's scout troupe to spend the weekend camping out at the farm. They were interested in this project and eager to help us finish the planting process. They all traveled the 300 miles from Madison and and set up camp next to the barn. During the night it started to rain and it rained all the next day. Lucky we had a big shed that we could move everyone in to for eating and to dry off. It was too wet to do anything with the trees (the furrows were full of water) so everyone packed up and drove back to Madison. It was a memorable experience for us all. Scouts shelter from the rain. After it dries out a little, there's still work to be done. Richard and I walking the rows and fixing the misses. Of course this meant we had to fix the trees ourselves. Richard and I worked on it this weekend - after it dried out a bid. Win, Kelly, and Roland walked many rows as well - as their schedules allowed. Plowed furrows 6' to 8' apart starting west of old field road and working down towards Hurley's woods. This area was never planted - it ran just north of the first 'five mile walnut' planting. We were hoping to have some luck with fall planting - something we hadn't tried. Approximately 425 seedlings grown in [See more about these D40 tree tubes].